The Achenbach Foundation for Graphic Arts, a lively component of the Fine Arts Museums of San Francisco, has scored a coup with a major acquisition: the complete (now and future) graphic archive of American artist Ed Ruscha (say Rew-Shay). Nearly 60 works dating from 1966 to 2000, drawn from the 1,100 graphic images in the archive, are now showcased in an exhibit at the Legion of Honor which runs through October 7. "Mocha Standard" offers a variation of the same image through a change of palette, a statement particularly apt in the print medium. Each of the images, seen together, plays off of the other, enhancing the perception of both through the contrasting impact of the differing hues–just one example of the added benefits of having an entire body of work in one place from which such juxtapositions can be arranged. Much of the work in the exhibit is focused on words and language, subjects which have been central to Ruscha’s interest over the entire period and which align him with conceptual artistssuch as Joseph Kosuth and Lawrence Weiner. For a 1970 series, "News, Mews, Brews, Stews & Dues" Ruscha chose words lightly associated with aspects of British life and culture; choosing a group of rhyming words gave the literal aspect of the endeavor a tongue-in-cheek quality, a subtle humor that often percolates through Ruscha’s work. At the same time, in "News, Mews, etc" Ruscha is experimenting with a wildly diverse array of printing materials: black currant pie filling, red salmon roe, raw egg, squid ink, Bolongese sausage, axle grease. But if the words elicit a giggle and the materials seem something of a droll oddity, the prints themselves are of surpassing elegance, utilizing a Gothic typeface reminiscent of an illuminated manuscript and a range of subtle textures, with colors from pale ivories to varied yellows and browns. Fifteen years later Ruscha had not exhausted the possibilities of this paradigm. "Sheets, Meats, and Eats" includes a bed sheet in its retail wrapping, a bag of Hershey’s Kisses, and steaks in a supermarket container in a composed still life on a background of lustrous red fabric. A completely different visual effect derives from the screenprint’s origin as a photograph. 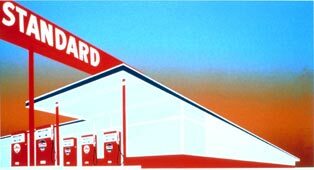 During the 1980s, continuing always to experiment with new techniques, Ruscha created prints, sometimes with words or letters, other times with familiar objects (a picket fence, a figurine), all in soft-edged silhouette against grainy, rather murky backgrounds. (See "Now" to the left.) One example in the show, "Ship," takes the almost cliched image of a sailing vessel and imbues it with a mysterious moodiness. More recently, as the permutations and combinations continue unabated, Ruscha places a fuzzy silhouette of a hunting dog in the midground of a print, with crisply clear sheaves of grain in the foreground that, in high relief, create a vivid three-dimensional effect. Ruscha’s interest in such depth of perception goes another step with his recent excursions into holography. Conceptual art, often beautiful (think Sol Lewitt or Hiroshi Sugimoto), sometimes feels very cold, emotionless in its focus on intellectual underpinnings. Ruscha’s combination of wit and endlessly inventive innovation avoids that pitfall and provides constant delight..